Once again here at the New Hampshire Notebook we cover not only the NHIAA teams and players but also the athletes who live in NH but go to a prep school or private school out of state. Recently Berwick Academy went on the road to play at Kimball Union Academy in a game that featured 3 of the NH's higher ranked prospects - senior guard Harry Rafferty and junior center Tom Nason from Berwick and junior wing Devin Gilligan from Kimball Union. Now even though we cover the entire state here it is tough for me to get around and see all the games I would like to. So it helps when there are some games I am able to see on film - this was one of them. Kimball Union won it going away, 78-53. After viewing the game tape here's what I thought. Kimball Union has one of the top prep school teams in New England this year. There's no question that Gilligan is getting better by playing on this squad. He gets to play against some of the top talent in the country. And he's playing on a team with Jesse Chuku (committed to Division I Lehigh University) ans well as junior point guard Devin Thomas and sophomore center Abdul-Malik Abu who are both future scholarship players. It's scary to think how good this team would be if Dimitri Floras stayed around instead of transferring back to Merrimack. KUA got off to a quick start in this game, taking a 20 point lead in the 1st half and never looking back. They were able to get layups inside while Berwick was taking a lot of outside shots and they weren't falling for the most part. Rafferty caught fire in the 2nd half to make the score more respectable. But he scored 35 of his team's 53 points in this game, so there's no question he needs some more help from his teammates offensively. He is being asked to literally carry his team, and he does a good job of it but against a team as good as KUA it's too much to ask of one player. Just like with the other prep school or MIAA games I've seen this year it is amazing how much faster the pace of the game is than NHIAA games due to the fact that they have a shot clock and the NHIAA does not. It's just a certain mind set that you have to play with when there's a shot clock - you have to get the floor up FAST get into your offense FAST and try to get a quality shot up FAST. Teams are also looking to fast break at every opportunity because they want to get a shot up before the defense gets set so they don't end up having to force any bad shots with the shot clock winding down. If the NHIAA were to put a shot clock in there would likely be a period of time where teams are getting used to it - there would be some crazy, frenetic games, lots of turnovers and ugly basketball. But once teams got used to playing with it they would become MUCH better as a result. Ok, back to this game and how the 3 NH players looked in this game. 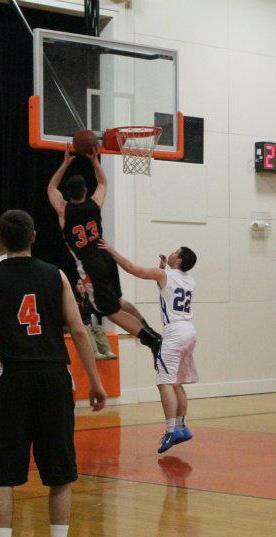 Harry Rafferty, 5'11" Guard, Berwick Academy (2012) - As impressive as it is that Rafferty had 35 points in this game, he actually should have had 40. That's because there was a play in the 1st half where he should have had an and-1 finish on the break but the official called a charge on him instead. Rafferty did a nice job of mixing it up offensively in this game, scoring on outside jumpers either off the catch or off the dribble and also scoring on a number of strong drives and finishes at the rim. He also showed the ability to not only score but to run the point, setting his teammates up for looks and showing good instincts at the point. Rafferty also got after it on the boards, played tough defense ad hustled after loose balls. He played pretty much the entire game and gave 100% every minute he was out there. He hit 6 threes on the game. And when driving to the rim he is VERY hard to stop when going left, if you want any chance defensively you need to force him right. Devin Gilligan, 6'4" Guard, Kimball Union Academy (2013) - Gilligan started and played the majority of the game for Kimball Union up until they took all of their starters out early in the 2nd half with the big lead. He had 10 points and 5 rebounds on the game, and of course he probably would have had even more if it was closer and the starters got more minutes for KUA. The fact that Gilligan is starting and scoring in double figures on a team with this much talent is impressive stuff, no question about it. He had some nice slashes to the rim and finishes in traffic and also battled under the boards and had a nice put-back after grabbing an offensive rebound. Gilligan is used to being the go-to-guy on the teams he has played for, so playing for KUA is good for him because you can tell how much better he ahs now gotten at seeing the whole floor, understanding spacing and how to create shots for teammates as well as himself. Tom Nason, 6'10" Center, Berwick Academy (2013) - Nason is a big man who is still developing but did show some nice flashes here and there. Even though he is a reclassified junior it wasn't until just this past summer when he really committed himself to becoming a better player, trying to realize his potential and start to face some better competition. He is still getting used to the faster game speed and more physical play at the prep school level. But the signs of a player ready to break out are there. Early on he was making some nice post moves but his shots in close just weren't falling, as he missed 4 shots in the paint in about a 2 minute span. He stuck with it though and kept on working. And then right after that he faced up to the basket from 15 feet, made 1 dribble towards the rim and then made a spin move into the lane and hit the shot. Then in the 2nd half he hit an 18-foot jump shot on the baseline off the catch - not bad for a 6'10" kid! Nason finished with 6 points and 4 rebounds on the game.